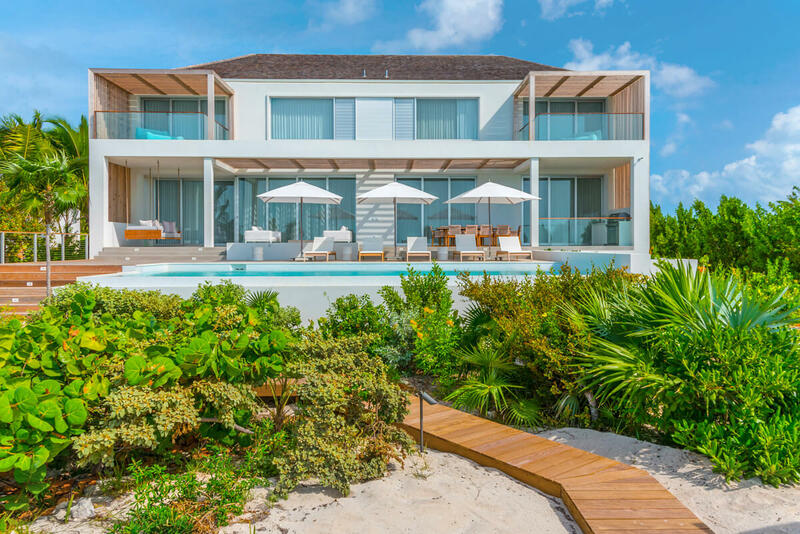 Beach Enclave is unique not only because it sits on Long Bay, but also because it has a resort feel and partnership with KiteProvo to offer guests the best Turks and Caicos experience. KiteProvo is one of the most popular water sports companies on the island, and offers Beach Enclave guests complimentary kayaks, paddle boards, and snorkeling gear. If you want to learn more about the island’s wildlife, check out the complimentary ecotours. On the ecotour, your group and a trained guide will wade through the beautiful mangroves around Long Bay on stand-up paddle boards. Its a workout for your body and mind! Oh and by the way - the villa is modern and amazing. Ideal for kiteboarding and other water sports! Beach Enclave Beach Front Villa has a modern design with sleek lines, exposed wood, and a surplus of windows. This resort villa is enveloped in tropical gardens and sunshine and sits steps away from Long Bay Beach. White sand and turquoise waves are steps away from the villa’s back deck. On the beach, guests can kiteboard, stand-up paddle board, or sunbathe. Beach Enclave’s partnership with KiteProvo offers guests kayaks, paddle boards, snorkeling gear, paddle snorkeling, and complimentary eco paddling tours through Turks and Caicos’ mangroves. Daily yoga sessions and a 24/7 fitness center are available at Beach Enclave’s Retreat center. The villa itself has a wooden sun deck with loungers, umbrellas, a barbecue grill, and an infinity pool. Al fresco dining tables sit by the pool and in the garden courtyard. Sliding glass doors open to the living and dining area, which is generously sized and elegantly furnished. High vaulted ceilings, neutral tones, and cool tile floors run throughout. The living room has plush couches and a flatscreen TV, while the adjacent dining table seats 10. Pristine white cabinetry and an oversized island furnish the kitchen, which is equipped with stainless steel appliances. A breakfast bar, blender, espresso machine, coffeemaker, and gas stove round out the kitchen’s amenities. This level has a media room and office, which feature the latest technology and sleek lines. There’s also a laundry room behind the kitchen. Beach Enclave has four bedrooms with neutral color schemes, balcony access, and ocean views. These four bedrooms located upstairs have the two master suites on either side of the guest suites. The master suites both have king beds and ensuite bathrooms with outdoor showers. The guest suites each have ensuite bathrooms, but one has a queen bed and the other has two twins that can be made into a king. The fifth bedroom downstairs has a king sofa pullout. The two-bedroom Garden Cottage is 626 square feet total, with a large covered deck, a kitchenette, and two bedrooms. Both bedrooms share the spacious bathroom, although only the king suite has direct access to it. The deck is accessed the kitchenette, and is surrounded by lush gardens. This villa is in Beach Enclave’s gated community, which offers onsite reception, a water sports facility, a yoga and fitness pavilion, beach service, and on-call staff. The villa is only 10 minutes from the airport and five minutes from Grace Bay. Transfer from the airport, daily delivery of a continental breakfast, daily yoga by Retreat, and daily pool and beach set-ups. Good for stays from May 1, 2019 to Dec 15, 2019. All Beach Enclave guests will receive a $700 voucher per stay/per villa to be used towards rentals and/or classes! All Rates exclude Government Tax and Service Charge. Good for stays from Apr 1, 2019 to Apr 28, 2019. *All Rates exclude Government Tax and Service Charge. Good for stays from Apr 29, 2019 to Nov 25, 2019. Good for stays from Nov 26, 2019 to Dec 3, 2019. Good for stays from Dec 4, 2019 to Dec 15, 2019.